Notes & Queries was started more than 30 years ago by Alan Harnik, known affectionately as “Big Al” to our customers and friends. The company was conceived in Madagascar, and then nurtured from a small pushcart in Faneuil Hall Marketplace in Boston in the late 1970's. 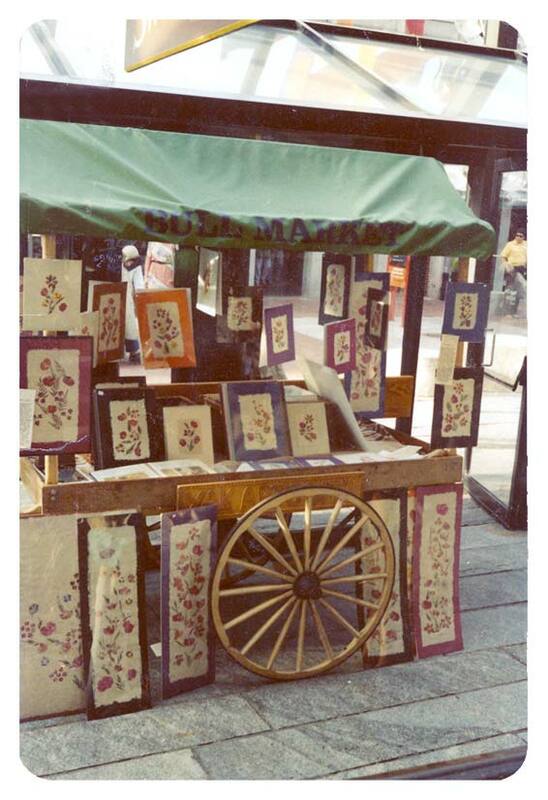 At that time, Alan was selling handmade cards and crafts from Madagascar and American handmade greeting card artists. The company grew from a pushcart to a basement apartment to an old airplane factory with no heat to a 12,000 sq. warehouse in Baltimore over a period of 35 years. Even now, Alan, along with co-owner and daughter Vanessa, share the same passion for the business he had those 30 years ago, and Notes & Queries continues to bring you the very best design-oriented greeting cards and stationery from Europe. For anyone who has met "Big Al", you know there is no one in this industry more enthusiastic and passionate about a great card than Alan. Enthusiasm is contagious! Located in the Middle River, a suburb east of Charm City, Baltimore, MD, Notes & Queries employs 20+ people. In fact, the average tenure of a Notes & Queries employee is over 13 years! Our warehouse manager started here boxing cards with our VP of Sales over 25 years ago, and nearly his entire family has worked here--all of his brothers and his mother. Currently, we have a set of sisters, a set of brothers, a father and daughter, and a mother and daughter all working in our office and warehouse. Notes & Queries is committed to bringing you the very best greeting cards available, bar none. Big words, we know! We do not publish greeting cards per se; instead we work with more than 25 publishers of greeting cards at any one time. Most of our trading partners are from the UK, the most competitive greeting card market in the world. We pick and choose among their offerings, using our 30+ years of know-how. In addition we often tweak or change the original designs to fit the US market. The end result is that we offer the very best cards to the US market. We release new merchandise four times a year. We offer a variety of different collections of gift packaging and various stationery and related merchandise. As with greeting cards, we can pick and choose from our trading partners’ merchandise to produce a collection of merchandise that your customer won’t find in all those big box stores. Notes & Queries is committed to providing our customers with the leading edge in design of paper products, be it cards, gift packaging, journals, stationery or boxed notes. This dedication is founded in our unrelenting search for new designs and products. Notes & Queries is committed to enhancing communication through design. As a company we are committed to offering our customers quality, delivery and customer service. We view our relationship with our customers and sales agents as a partnership, for without them we would not exist.